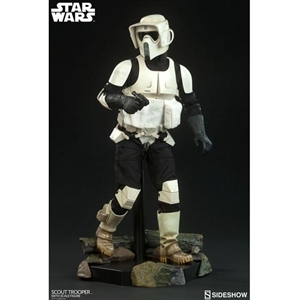 “A small rebel force has penetrated the shield and landed on Endor.” Sideshow is proud to present the Star Wars collectible Scout Trooper Sixth Scale Figure, from Star Wars Episode VI: Return of the Jedi. Suited for mobility while patrolling the forest moon of Endor, the Scout Trooper Sixth Scale Figure is equipped with a detailed helmet and unique Imperial armor, including front and rear torso armor with a power unit backpack, as well as shoulder, hip, knee, and arm guards. The figure has a black fabric undersuit with a vest and cummerbund pouches. 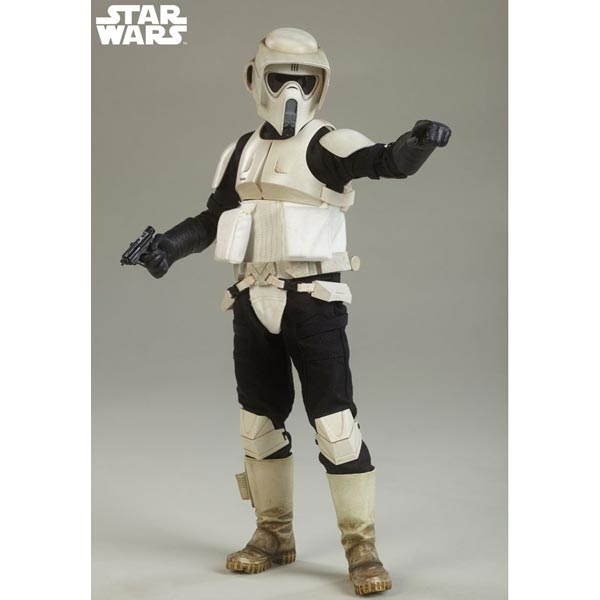 The Scout Trooper has two pairs of swap-out boots, including standing and action boots. In order to combat the rebel forces, the figure includes a blaster pistol, and seven interchangeable gloved hands including a pair of tight C-grip hands, left loose C-grip hand and pointer hands, and right single and double-finger trigger hands. Display the Scout Trooper on the black hexagonal support stand, or add the included Endor forest elements to the base for an enhanced environment. Pair the Scout Trooper Sixth Scale Figure with the Speeder Bike accessory, sold separately, to recreate the exhilarating chase scenes from Return of the Jedi.